Responsive web design is when your website theme or template works on all devices. Having a responsive web design means that no matter what device your site is viewed on it will customize the design to the device its being viewed on. 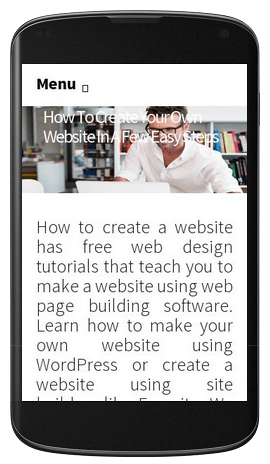 Its important that your site looks good on mobile devices, tablets and computers in this day an age as if its not you will loose out. It can also effect your ranking on Google if your site is not responsive. Mobile Phones – You need to find themes or templates with a responsive web design this way no matter what device visitors view your site on the design will be great. Today more and more people use mobile devices to search the web and if you want to compete with your competitors you have to move with the times and make sure your site works on all devices. WordPress – The best way to build a website or blog would be to use WordPress, and there are loads of responsive WordPress themes to choose from with fantastic designs. Responsive Web Design is the approach that suggests that design and development should respond to the user’s behavior and environment based on screen size, platform and orientation. Make sure your site has a responsive web design. Responsive web design means the site or blog will automatically adjust itself to look good and read nicely on computers, tablets and mobile devices. The best part is you do not need to learn any coding or edit your CSS coding. All you have to do is make a website with WordPress and find responsive web design themes. These themes are designed by professional web designers to work on any device, no matter what size the screen is your site will look good. Responsive web design is not only about adjustable screen resolutions and automatically re-sizable images for the device they are being displayed on, but rather about a whole new way of thinking about design.